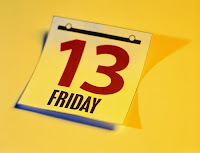 J: Take extra care today because it's Friday the 13th. Me: We should not believe that. God is more powerful than any superstition. J: Haven't I told you that I almost drowned and was hit by a car before? Both happened on Friday the 13th. Me: No you haven't. I think that's just coincidence. I don't think God would create an unlucky day. How can we call ourselves Christians if we believe such superstitions? Don't we trust that God will protect us and won't allow us to be harmed and pained beyond recovery? When we believe in superstitions, we somehow acknowledge that there is something more powerful than God that He cannot control. It is only God that we should trust, whatever calendar day it is.